The Loraine Club was recently purchased in 2016 by a family who has deep roots in Britt/Bying Inlet, coming here since they were young children to their own nearby family cottage , and being the 5th generation of their family with ties to the area. 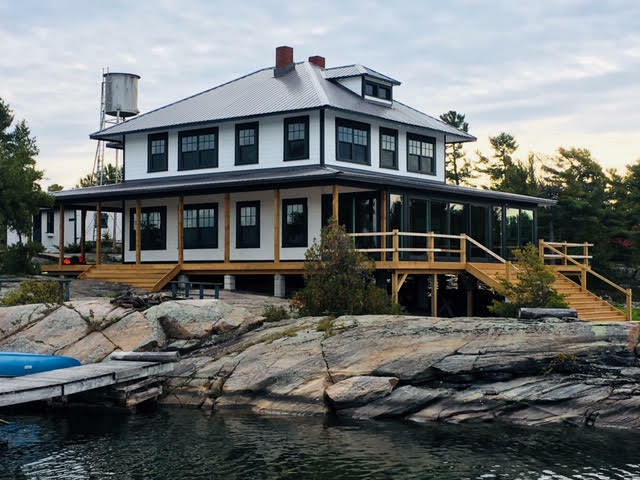 Since purchasing, the Loraine Club has been updated, keeping the authenticity of the old Georgian Bay style. The Loraine is comprised of a main building including six bedrooms. In total, there are beds for 14-16 people. The Loraine property is an eleven-acre parcel on a forty-acre island, the only private property on the whole island. The rest of the island is vacant crown land, that is owned by Canada and is not available for sale or rent. The main building includes a large stone fireplace, a six burner dual oven Garland stove with a griddle, a gas refrigerator, a gas barbecue, and a large deck around three sides of the building, accessed through large glass sliding doors. The main floor is fully open concept with panoramic views of the Georgian Bay. There is a three-piece bath on the second floor, although guests are asked not to overuse the old septic system as use of the ‘outhouse’ is encouraged – if not preferred for its view! The dining room will accommodate 12-14 people comfortably. The Loraine faces south–west for lots of sunshine and beautiful sunsets, with a view of the lighthouse in the background. Two steel boats built in 2000, with 10 and 15 hp motors (2000 and 2002), kayaks and a canoe are available for exploring the endless islands, inlets and outlets along the beautiful north–east coast of Georgian Bay. Plenty of room is available along the 100+ foot dock for guests who arrive by water, and a water taxi service is available at Wright’s Marina for guests who arrive by road (paid parking to leave your car). However, the Loraine is not for everyone. There is limited wifi; you can find cell coverage throughout the property at higher elevations. (Best to bring a portable charger.) Marine band VHF radios do work in the area. The Loraine families and friends prefer the intimacy and authenticity of the Loraine without the creature comforts of the city.